While staying at this hotel in Prague, guests will be able to experience the culture and history of the city by visiting the museums and historical sites. Guests will also find many places around the Hotel Chotol Prague where they will be able to shop and dine. 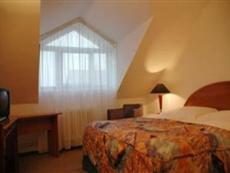 Some attractions are within walking distance of the Hotel Chotol Prague. Reaching other areas, including the airport, is easy with the aid of public transportation. The hotel offers transfer to the airport as well. All of the rooms for guests at the Hotel Chotol Prague include amenities such as TV, private bathrooms, bathtubs, and shower. The rooms also have mini bars. Guests will be able to have their pets in the room at the hotel, and they will be able to use the hotel's room service. Guests will find that the hotel offers an onsite bar and an onsite restaurant as well as hotel and airport transfer. Other amenities at the Hotel Chotol Prague include massage, sauna, squash courts, and tennis courts.